The Delhi Polytechnic entrance test 2018 is a test for those students who want to seek admission into Engineering and Non Engineering stream. The DTTE i.e. Department of Training & Technical Education board gives the admission into 1year 1 sem for eligible students through DELHI CET in various Full-time Diploma programmes (Engineering and Non Engineering) being offered at Institutes affiliated to the Board of Technical Education (BTE), Delhi. The Delhi CET is also give lateral entry to those aspirants those are have CBSE 10+2 (Vocational Engineering Stream) from Schools located in Delhi & those from Industrial Training Institutions located in Delhi & affiliated to SCVT / NCVT. 3. Online payment of Delhi CET test. Delhi CET Eligibility 2018: In the Delhi CET there are 5 test available and for all 5 test there are certain Delhi CET eligibility criteria. 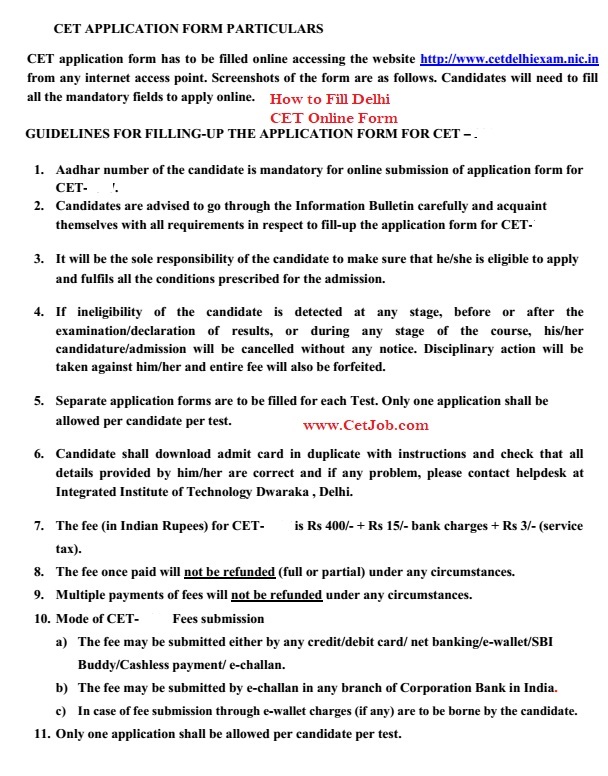 If you are Delhi CET eligible candidates than you have to apply Delhi CET. 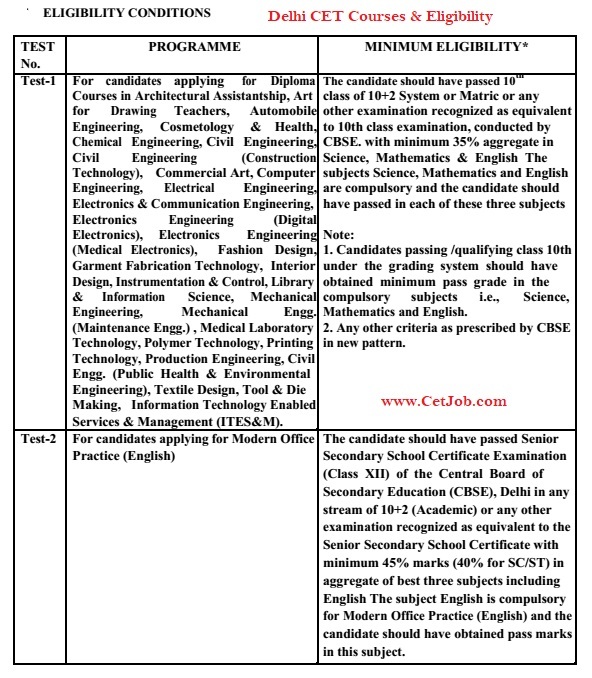 Most of test wants 10+2 minimum eligible criteria for Delhi CET exam. Delhi CET Reservation: It is very good news for those candidates who are in reserved category. 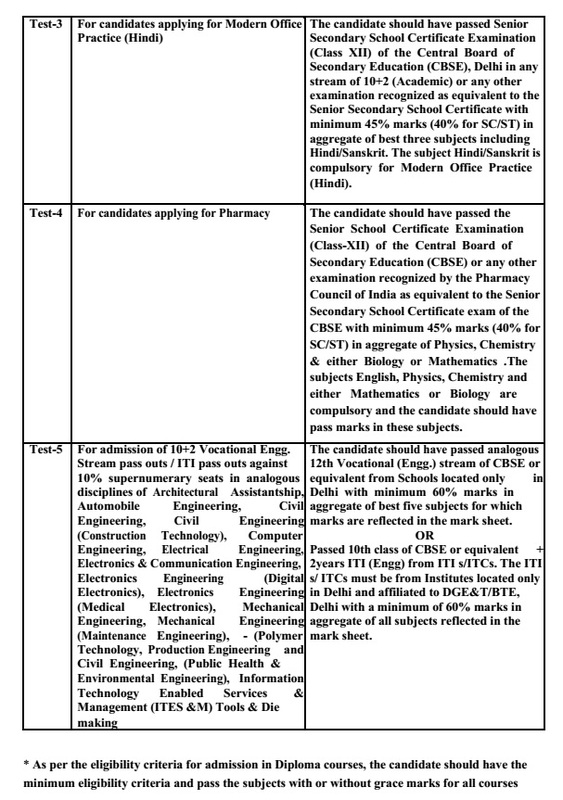 In the Delhi CET 2018 some seats are reserved for reserved category candidates. Delhi CET Syllabus 2018: If you applied for the Delhi CET exam than you will face Delhi CET test. Before taking Delhi CET exam candidates must go through Delhi CET syllabus for Delhi CET Test 1-5. You should have passed (10+2 system) 10th class or equivalent to 10th class examination, conducted by CBSE; and having minimum 35% aggregate in Science, Mathematics & English subjects. Architectural Assistantship, Art for Drawing Teachers, Textile Design and Tool & Die Making, Information Technology Enabled Services & Management (ITES&M). You should have passed 12th of the CBSE in any stream of 10+2 (Academic) or equivalent and having minimum 45% marks (40% for SC/ST) in aggregate of best three subjects including English. You should have passed 12th of the CBSE in any stream of 10+2 (Academic) or equivalent and having minimum 45% marks (40% for SC/ST) in aggregate of best three subjects including Hindi/Sanskrit. The subject Hindi/Sanskrit is compulsory for Modern Office Practice(Hindi). Delhi CET Test 4 for Pharmacy course. any other examination recognized by the Pharmacy Council of India as equivalent to the Senior Secondary School Certificate exam of the CBSE with minimum 45% marks (40% for SC/ST) in aggregate of Physics, Chemistry & either Biology or Mathematics. Passed 10th class of CBSE or equivalent + 2 years ITI (Engg) from ITI s/ITCs. The ITI s/ ITCs must be from Institutes located only in Delhi and affiliated to DGE&T/BTE, Delhi with a minimum of 60% marks in aggregate of all subjects..
Delhi CET Test Types 2018: After checking the Delhi CET syllabus 2017 candidates also advised to read Delhi CET test pattern; because with the help of Delhi CET test pattern candidates ensure about Delhi CET exam. Delhi CET Admit Card 2018: As we know that the Delhi CET held on Month of June 2018; all candidates advised that please download Delhi CET Admit card through official website of Delhi CET. Because the Delhi CET Hall ticket contain necessary information like Delhi CET Roll Number, Delhi CET Center Name, Delhi CET Center Address; etc..
Delhi CET Answer Key 2018: After the Delhi CET exam all candidates are very eager to know Delhi CET test answers. With the help of official Delhi CET Answer key 2018 all candidates ensure their position into Delhi CET affiliated colleges. All the students also verify their Delhi CET Answers with official Delhi CET Answer key and Delhi CET Solution 2018. Delhi CET Results 2018: After cross check Answer with Delhi CET Answer key all students are also very eager to know their obtain marks in Delhi CET test. With the help of Delhi CET result and Delhi CET score card aspirants know their All India merit rank of Delhi CET and category Merit rank of Delhi CET 2018. 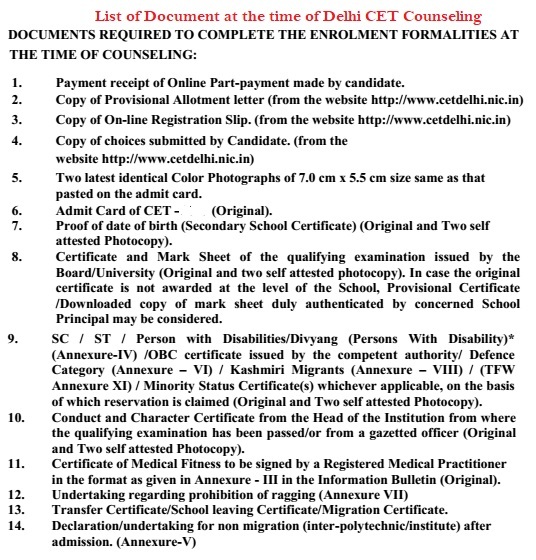 Delhi CET Counselling 2018: After disclosing the Delhi CET Results 2018; all qualified are very eager to participate into Delhi CET counseling process 20187. 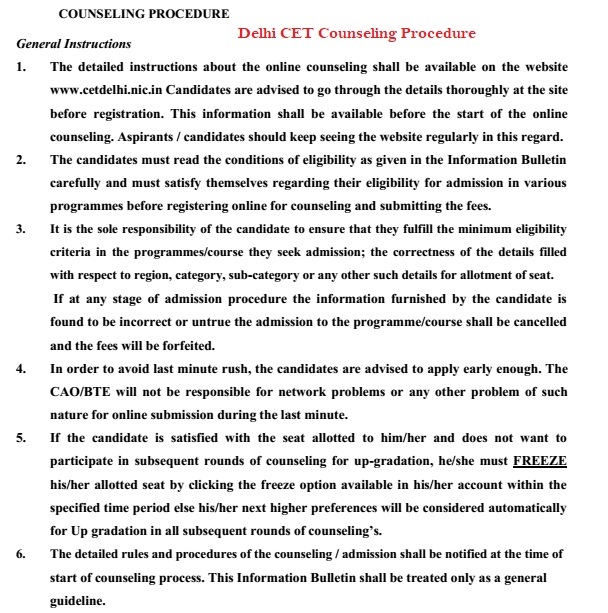 After some time of Delhi CET Results 2018 Delhi CET board announced the schedule of Delhi CET counseling at official website.